It was perhaps the most raucous if not the raunchiest public radio benefit one could imagine. 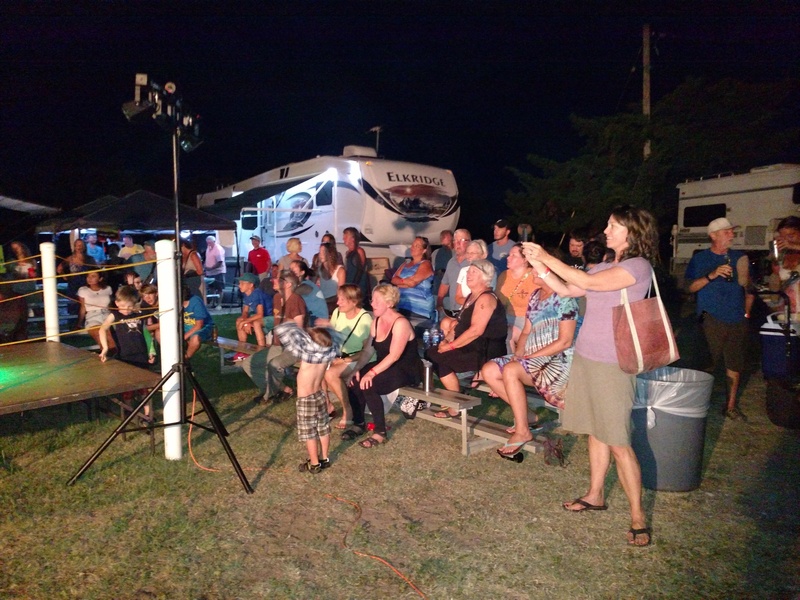 Picture this – a campground behind a Texaco, hidden from the road, aluminum bleachers and a makeshift bar encircling a makeshift fighting ring. Golf carts and cars are parked in equal measure in the dirt parking lot and alongside the road. Spectators are gathered under the evening sun, drinking everything from Coors Light to Bud Light from a makeshift bar made of discarded 6×6 beams. Everything is surrounded by huge camper trailers with accouterments indicating varying degrees of permanence – string lights, laundry lines, lawn furniture. The nexus of excitement is the pod of costumed combatants bouncing giddily next to a golf cart next to the ring. The warriors are bedecked in everything from Dali moustaches to bloodied wedding dresses. A comingled sense of exuberant fun and the tension of impending competition colored the air. 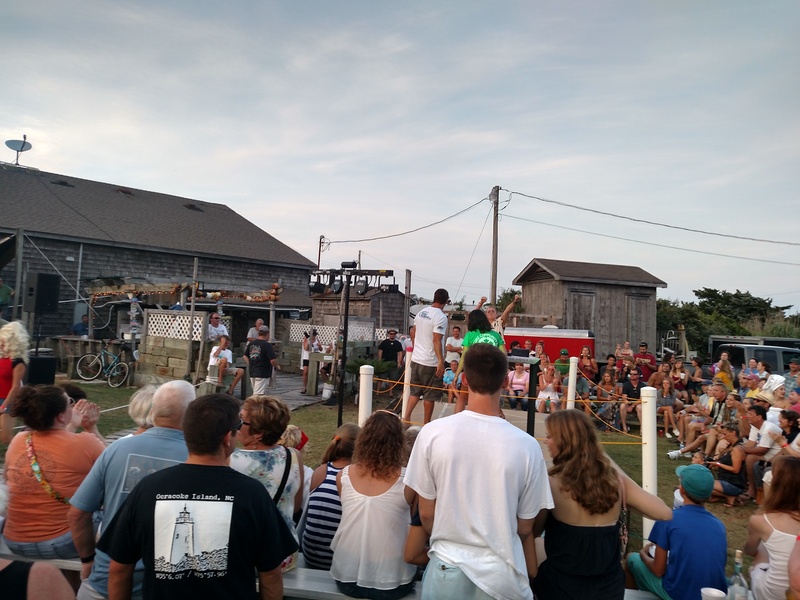 The 7th Annual Women’s Armwrestling Contest was held June 18th, 2015 on Ocracoke Island, a semi-sanctioned armwrestling event sponsored by Combat Armsports and benefitting WOVV 90.1, the local public radio station. Combatant sign-ups were still taking place as spectators took their seats – anyone who felt lucky enough could try to best a motley collection of locals and mercenary vacationers. Ocracoke Island is a small, thin stretch of land in North Carolina’s Outer Banks. The island is sixteen miles long and less than a mile at its widest and is accessible only by ferry. It is an old, small sea town whose relative quaintness is maintained by a National Seashore designation and strict building codes. (One builder tried to flaunt these regulations and was required to dismantle the entire top floor of the enormous home he built.) But despite its clapboard homes and the infinite amount of basketed, slowly-pedaled bikes, Ocracoke is also known for its legacy of piracy. It’s the place where Blackbeard the Pirate was not only beheaded but whose headless body swam around his ship seven times before it sank. Ocracokers are hardy just by dint of living there – hurricanes blow through with dispiriting regularity, causing evacuation and a proliferation of stinking muck when floodwaters recede, and the mosquitos are stuff of legend. Armwrestling, then, is not a cultivated hobby but a demonstration of inborn strength. The island has approximately 970 permanent residents, but given the ever-changing stream of weeklong vacationers, it’s rare that a strong local presence is detected. (The average summer week ratchets the population to seven thousand.) Local flavor wasn’t missing at this event, however. The armwrestling tournament is one of the premier events on the island. 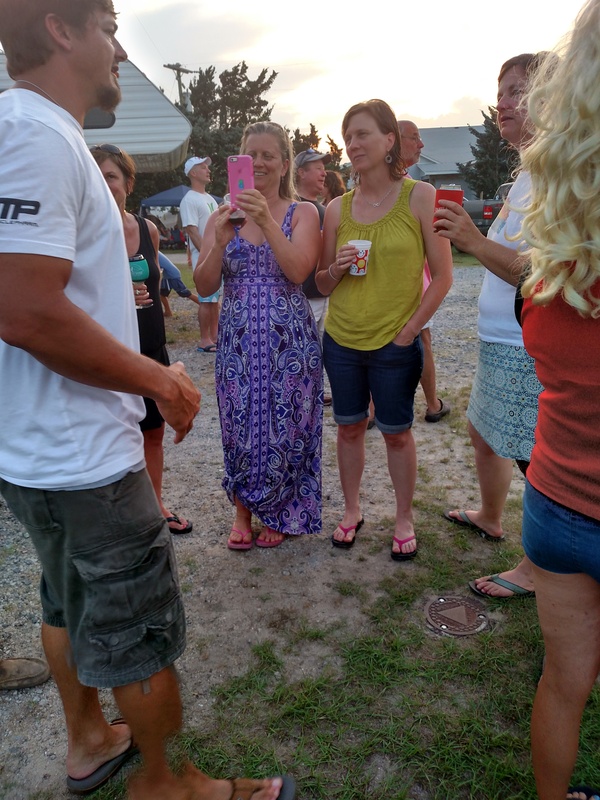 At least half of the 2015 competitors were residents of Ocracoke, and this was a lower percentage than most years. Most everyone else in attendance was strongly encouraged to attend, if not sign up, by the waitress or clerk or local working at whatever facility the vacationer was patronizing. The camaraderie of contestants who work and swim and party together and the fun of an event clearly anticipated by the people that live there gave spectators the sense that they were sitting in on the proceedings of a different world. Clearly it was a different world no matter where you came from. The stage was made of four rickety fold-out stage rectangles with nylon rope running through holes drilled in PVC pipe turnbuckles. Special thanks were given by the announcer to the “guy who spent all day in the sun setting up this fine venue.” A whiteboard sat in the grass, leaning against the announcers booth, the brackets penned with numerous cross-outs and revisions. In the first of many such instances, the PA kicked on with a startling burst of noise. The transitions between music and announcing always featured one of the two being significantly louder than the other, as if to shock you into attention, and a balance was never quite reached during the entirety of the event. No matter – attention was grabbed and the contestants were summoned to the ring to learn the rules. Locals came from the ringside party and the brave vacationer-competitors left groups of friends in the bleachers. Incredibly, a professional arm wrestler had been brought into referee the event. He was the Man, the Myth, the 220lb armwrestling champ from Sunbury, North Carolina, a beefy toned and tanned guy with the incongruous name Giles Russell. 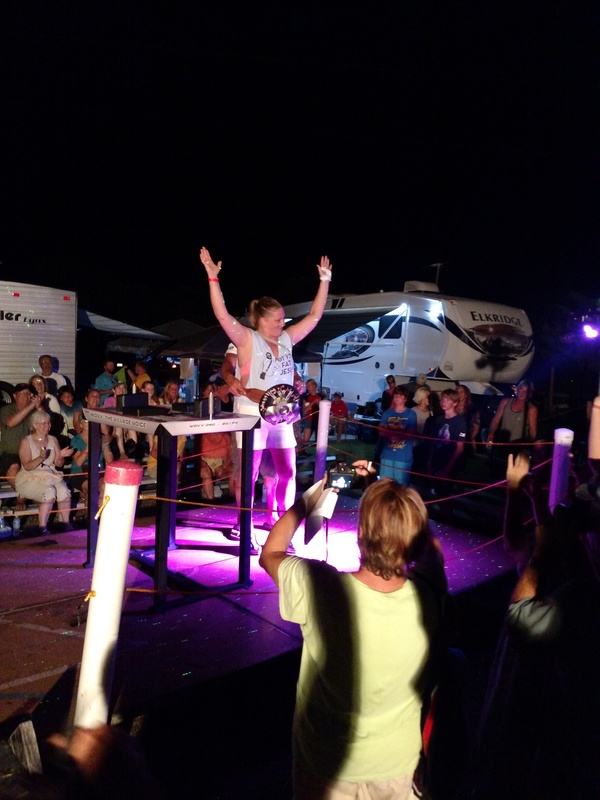 Everyone gathered in the ring around a professional armwrestling table furnished by Combat Armsports. He imparted how it would all go down. The ceremony was brief, and Julie, alias So Fresh So Clean Clean in reference to the hotel-white towels wrapped around her torso and her hair, summarized how you play for her friends. 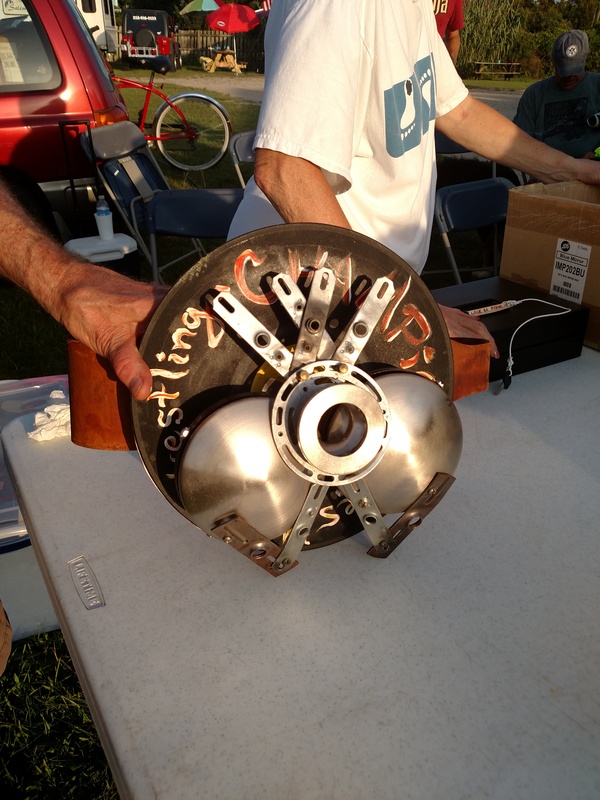 “You have to break the plane of a small cushion,” she said. A tournament-ready armwrestling table has two cushions on the outside of an open battlefield, where combatants’ elbows rest. There is an open area in the middle, with two strikepads on either side. These are the cushions a wrestler has to touch with her opponent’s hand. Vertical poles with grips are next to the elbow pads. These are held by the non-wrestling hand for leverage. As soon as a hand touches the strikepad (or wrist in the case of combatants with forearm-size disparity), the bout is over. So Fresh took a swig from her beer. Approximately 85% of the audience was drinking. So Fresh was with a group of friends from Nashville, New York, and Maryland. They were staying on Cape Hatteras and had planned on a day trip to Ocracoke but when their server at Howard’s Pub was so effusive in her recommendation of the tournament that they decided to stay and throw one of themselves into the fray. So Fresh was calm, jovial, a little tipsy perhaps. There was the faintest glimmer of intimidation. Her friends also offered coaching tips. Another squall of feedback made everyone jump. The announcer rattled off a list of the sponsors, which was practically half the businesses on the island. He gave props to WOVV and said that the event would be starting momentarily. In years past, the tournament was a benefit for both the radio station and the fire department. In 2012, $3,200 was raised for the radio station and $1200 for the fire department, but the event now benefits the radio station exclusively. The tournament is held every year on the anniversary of the station’s first broadcast. Ultimately fifteen contestants had signed up. A few were recurring combatants. 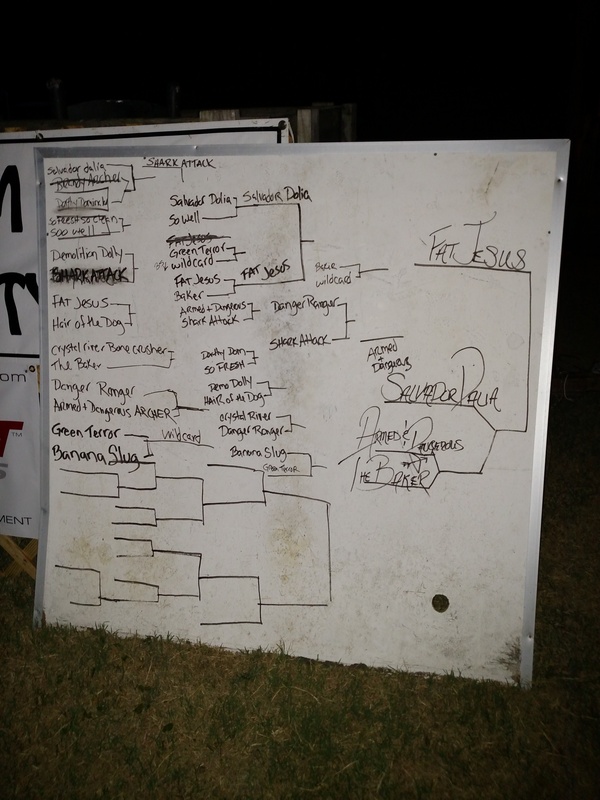 This was the third tournament for Fat Jesus, for example. Those who were new were encouraged to make up a nom de guerre and an exciting back story. All contestants could rest a little easier knowing that Karm “the Arm” Laton retired after winning the last four tournaments straight. Armed and Dangerous Archer – who had machine guns made out of electrical tape on her biceps and a white cape with a machine gun on it and the phrase “come and take it” held around her shoulders with handcuffs. Her “favorite athlete is herself,” according to the announcer. Salvador Dalía – she had a Dalí moustache on her face made out of electrical tape, blue hair, and stars tattooed on one temple. Two giant melting clocks hung from her chest. “She’s here to melt your clock!” the announcer noted. The Baker – walked up to the ring throwing bread crumbs into the audience. The puffs of powder were backlit majestically by the spotlights. She was wearing an apron and is a Pisces. Dorothy the Dominator – wore a St. Paul’s Girl-style dress and drank a lot of Corona. She had an ankle brace but no shoes. She was announced as being from Oz. So Fresh So Clean Clean – wore towels around her hair and torso. From New York by way of Ohio. She was skeptical of another combatant’s claim of Ohio roots and took this as some kind of obscure taunt. At least six friends were there to cheer her on. “Fresh outta the shower!” yelled one. Wildcard – had mom jeans, hair bun, and a sleeveless button-up with what seemed to be a hipstery print. She was “raised by wolves in Nepal” and brought a Red Stripe up to the table with her when she wrestled. She is the one who So Fresh thought was lying about her Ohio origins. Shark Attack – she danced her way up to the stage to tropical pop songs and gnashed her teeth and made intimidating shark fin gestures at her opponents. She was wearing a bloodied dress and was revealed to have two prosthetics legs from the knees down. She occasionally took one off and menaced the crowd with it. Hair of the Dog – wore her salt and pepper hair long and windblown. She was bedecked in all white and didn’t talk to anyone. Danger Ranger – is a Sagittarius from the Pennsylvania section of Appalachia. Her hair was a battle-ready ponytail and she wore a Yellowstone Park tee. Everyone was thus introduced, and with a classic ‘LET’S GET IT ON!’ the armwrestling was underway. Salvador Dalía trounced Dorothy the Dominator in under a second. Soo Well was so evenly matched with So Fresh that there was a stalemate for minutes until Soo Well finally won. The bout between Shark Attack and Demolition Dolly was restarted after a false start, then Shark Attack won in less than a second. “I’m all arms!” she yelled. Fat Jesus sidled up to the table against Hair of the Dog, whose super, super-serious expression was no help. The losers of the last two rounds looked like they were actually mad. The Baker threw out crumbs as she walked to the ring. She fought Crystal the Bone Crusher and won. The announcer made a brief announcement. “Look into your pockets! Aside from the money should be donating to WOVV, somebody lost an iPod!” Armed and Dangerous Archer beat Danger Ranger fairly quickly and then went back and hugged her sons. After a serious positioning of the arms by Russell, Wilcard beat Banana Slug. Post-round, Russell was encircled by wrestlers and fans. He was imparting his wisdom to anyone who had questions. The atmosphere was one of revelry and intense concentration, depending on the role for the night. Demolition Dolly and Hair of the Dog listened attentively, having lost their first bouts rather quickly. (Though to be fair they did lose to competitors who made it to the last rounds.) They both had the look of someone really trying to internalize something, as if stalwart concentration insures the ability to put it into practice. They were the most serious competitors; the pained expressions and their stony silence indicated that they were taking this really seriously. “You can slide your elbow all over the table. You just can’t pick it up,” Russell said. “So when you’re pullin’ and she’s pullin’ and you realize you have all this space behind you, start pullin’ her back. The next move should be a drag. Open her arm up. A subtle drag. Do it subtly or you may open your own arm up. Good arm wrestlin’ is keepin’ ‘em locked nice and tight then start draggin.’ You wanna take everything down together, like this. [Here he showed her a fluid takedown motion, their hands interlocked like they were wrasslin.’] Not doing that is not good armwrestling technique – it’s ‘hurt yourself bad technique.’ I want everyone to have fun and an injury would be a huge buzzkill. Much is thought of Russell’s expertise. It is his fourth time reffing the Ocracoke tournament. Arrangements were made for his family to accompany him. His wife, daughter, and a thinner version of Russell who the announcer kept referring to as Young Giles were there with him. His wife Tabitha was photographing the event and sat near him as a cadre of women with wine glasses filmed his impromptu lessons, giggling as they asked him to flex again and again. Young Giles looked on in awe. He was a little shy still but was no doubt eagerly awaiting the time he’ll be able to reap the benefits of the family sport. (The women slyly asked Russell the Elder about his leg placement during matches.) Young Giles was there as an assistant, and between rounds he had to take on a seemingly unending line of kid competitors taking up the offer to get on stage and arm wrestle him, including a battle with one of two kids in the audience that night that for some reason looked disturbingly like adults. Papa Giles gave his son a little nudge here and there to tell him he should let a kid win. Even as a teenager Young Giles was gracious in defeat. In one particularly endearing scene, Russell called on his daughter to come on stage and arm wrestle her brother. She leaped with excitement and ran up to the table and after a long struggle beat her brother. She strutted around in victory and then Young Giles held her over the ropes as she flexed for the crowd. The crowd went wild. She was in on the family sport too. She told a nearby spectator “I wrestled him all day in the hotel and I beat him. Don’t mess with me!” The last line was delivered with surprisingly sincere menace. Green Terror fell like a chomped vegetable to Wildcard. Dorothy took off her flip-flops as she took on So Fresh. Dorothy won and So Fresh pretended to cry. Soo Well lost to Dalía in what was a “live art performance.” “I get really pumped up,” Dalía said. “That’s not to say I train – I’m just naturally this awesome. I’m totally competitive – haven’t you seen me?” The announcer mentioned that the winner would get to wear the belt for “twenty-seven minutes” before giving it back. Despite the advice from Giles, Demolition Dolly was taken down by Hair of the Dog, who apparently did benefit from his lesson. Fat Jesus fought the Baker – it was a match between two of the strongest contestants and the hefty savior won. Crystal the Bone Crusher fought Danger Ranger in a match that featured unchanging expressions and eye-contact broken only after what seemed like minutes of the most extreme strain. Danger Ranger won. The PA played a funny “Fwee!” sound at every loss from now until the end. “We got someone from morning radio here!” said the announcer, even though he was the one in control of sound effects. Armed and Dangerous Archer, whose “guns are banned in twenty-six states,” fought Shark Attack. From this point on Shark Attack made a point of wiggling her behind at the crowd and tucking her dress into her lacy blue underwear. Despite her taunts and fierce expression as her opponent walked up to the stage, Archer won. Banana Slug slimed Green Terror. After the round, the announcer bid people try their luck against Giles when the tournament was over. “Anyone want to take him? He’s out of shape.” Russell affected a slouch and pulled down on his bicep like it was drooping. Soo Well lost to Dorothy the Dominator and was eliminated. Wildcard flirted with the ref but still lost to Salvador Dalía. Spectator A: “She does that every time.” B: “What?” A: “Win.” All of the contestants ran up to the ring for the match between Danger Ranger and Hair of the Dog. Hair lost and the FWEE! effect played. She was eliminated. Shark Attack, who “loves foot rubs,” shook her booty, tucked her dress, eliminated Banana Slug, and then grabbed her chest and stuck her chin out at the crowd. A new explosion sound effect played. After noting that she “lost her pet monkey but collects monkeys and giraffes,” Fat Jesus beat Armed and Dangerous Archer. The Baker, an Ocracoke native, eliminated Dorothy. A guy yelled out a taunt that made the crowd laugh. He thought he could do better, apparently, as he said “No, no that wasn’t good” about his own comment. Danger Ranger was up against Shark Attack, who did her now-standard dance-and-tuck (the sixth time her dress was tucked into her underwear, according to one observer). Shark Attack won and DQ’d Danger. Then the battle of high hair buns – Wildcard vs. the Baker. The Baker’s bun was stronger. Tacky rock music played the whole time, including “Happy Happy Birthday.” Fat Jesus fought Dalía; both were up to this point undefeated. But it was a quick fight – Fat Jesus won. Shark Attack fought again, this time against Armed and Dangerous Archer. Despite her physical taunts and chest-grabbing, Armed and Dangerous further bloodied her dress and kicked her out of the tournament. “Ocracoke is a community of costume lovers and connoisseurs. We have lots of reasons dress up as much as possible. We take the costume contest more seriously than the actual armwrestling,” explained Salvador Dalía. Easy to say when you are crushing the contest physically and sartorially, perhaps, but it was true that Ocracoke is a lover of costumes. Past costumes included a full-body rabbit costume with huge mask/helmet and a muscle suit with hand-sewn muscles. Before Round 5 started, the winners of the costume contest were announced. 2nd) Shark Attack, who accepted the honor with trademark shark grimaces and sneers at the audience. Winners received a gift bag of indeterminate contents. The costume winners were shuffled off and the next round started. The Baker roasted Archer, rendering her stale for good. The Baker fought another round right away, flinging flour as she walked up to the stage, and knocked Dalía out for good but granting Dalía a third place finish. Fat Jesus didn’t have to fight this round because she was undefeated. Round 5 determined who would fight her for the title, and the lucky contestant was The Baker. At this point the mosquitos were doing their customary duty and annoying the fat bejeesus out of everyone. Supposedly their role in the ecosystem is critical – food for bats and other creatures and all that – but the constant biting typically leads one to completely ignore this alleged benefit and wish them all an equally annoying death by a thousand bites. Your 2015 Champion FAT JESUS! The Baker had to win twice for the title since she had already lost once and Fat Jesus hadn’t lost at all. The Baker stood valiantly, hoping that the Gods of Armwrestling would shine down on her. Would it be one of those classic underdog stories? Would her pure desire be enough to turn the tide? Alas! No! The Baker was dispatched with the power one could expect from the unbeaten maniac known as Fat Jesus! The belt was presented to the victorious Fat Jesus for photo-ops and to bestow its power to the champion that earned it, at least for twenty-seven minutes. Giles presented her the belt but it fell apart as he handed it to her, clanking loudly onto the ring. Fat Jesus threw her hands up in the classic pose of the victorious, and Giles held the busted belt around her waist. Locals and vacationers celebrated her success. Do we have a new Karm “the Arm” Laton in the making? Perhaps! 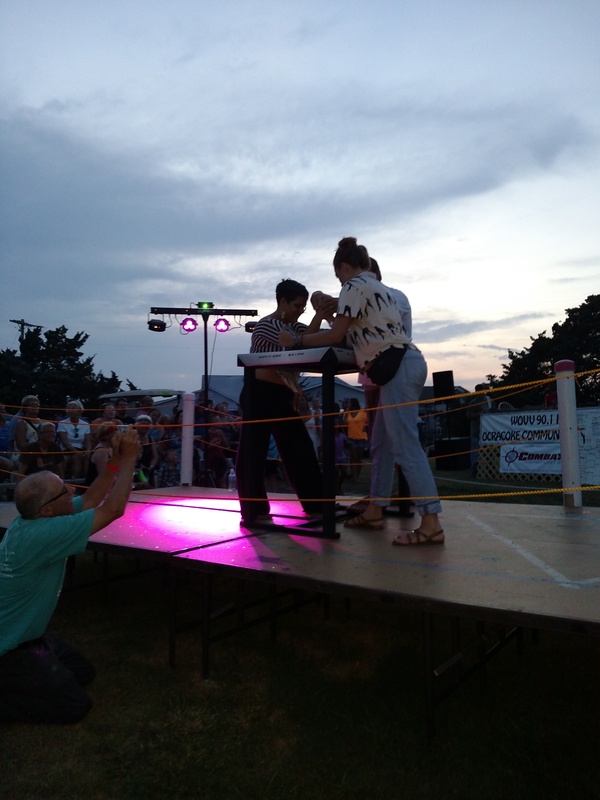 Only next year will tell, at the 8th Annual Womens Armwrestling extravaganza on the one and only Ocracoke Island!